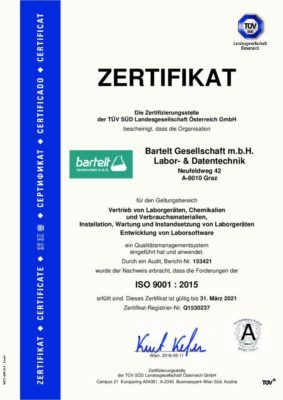 In the areas of laboratory equipment, laboratory consumables and laboratory fittings, Bartelt Gesellschaft mbH (Limited Liability Company) is among the leading companies in Austria, with its headquarters in Graz and branch offices in Vienna, Linz, Innsbruck and Budapest. The company was established in 1936 as a family business, and today is run by Fritz Bartelt, third generation of the family. Bartelt is a family business. Through reliable and respectful cooperation, we create a trusting working environment together and in a team, which is characterised by tolerance, acceptance and harmony as the basis for successful cooperation. Bartelt stands for the highest possible professionalism, best quality and absolute reliability. Personalised solutions, quick order processing and high flexibility are part of the way we are. And this has been the case for many decades. We are ISO certified since 1999. Our high quality standards both express and provide a guarantee of the professionalism of our family business. We are your expert partner for products and services related to laboratory equipment and fittings in Austria. We deliver everything you need, from laboratory equipment and accessories, through laboratory furniture to chemicals. Our service department provides professional commissioning and maintenance of laboratory equipment, and offers everything from a pipette calibration service to deep freeze maintenance. As a software provider to laboratories, we bring our lengthy experience and high skill levels to the development and maintainance of software products (laboratory information management systems (LIMS)), for example for clinical diagnostic laboratories (datalabX) and for managing blood banks (datalabXdepot). Our route to the customer is via our competent and dedicated employees, our on-line shop, and also through efficient e-commerce solutions and our locations in your vicinity. We promise speed and efficiency, and keep abreast of the current state of the art of technology and find customized solutions for your equipping your laboratory. We are happy to give you personal advice. Give us a call or send us an email. We are eager to serve you!